Medialink MWN-WAPR150N is 802.11n wireless router and it’s developed by Mediabridge. This wireless-N router utilizes advanced technology compatible with IEEE 802.11n, IEEE 802.11g and IEEE 802.11b standards, and so it can provide up to 150Mbps stable transmission rate. It works as router, wireless access point, four-port switch and firewall in one, and overall it’s suitable for SOHOs (Small Office/Home Office) and family networking. It supports all of the latest wireless security features, such as 64/128-bit WEP, WPA, WPA2 encryption methods, packet filtering and port forwarding, to prevent unauthorized access and protect your network against malicious attack. In addition, URL and MAC address filtering can make it easy for parents and network administrators to manage network and QoS bandwidth control over specific computer’s downloading speed is supported as well. This wireless-N router also supports WDS (Wireless Distribution System) function for repeating and amplifying the signals to extend the wireless network coverage. Setup can be easy and simple for non-savvy users by using setup wizard on CD-ROM. 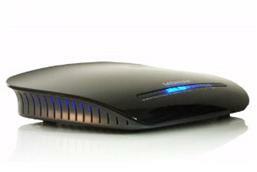 If you are interested, find out more about this Medialink MWN-WAPR150N wireless-N router here. Well, now having the need for a wireless N network I did a bit of research into which router I should buy. After reading so many positive reviews, I kept teetering on whether or not I should try this one out... especially since I hadn't heard of the company and the price point was so low. Eventually I figured "what could it hurt" and ordered it. I immediately got an email from the company thanking me for the order which included the support information if needed. That was a nice touch. The bottom line is that I'm VERY glad I ordered this. Set up was a breeze if you follow the very simple instructions to the letter. I was up and running in minutes. My other concern was how well it would sing with my Cisco Wireless N Bridge(The Cisco-Linksys WET610N Dual-Band Wireless-N Gaming and Video Adapter)in my living room which is notoriously finicky with non-Cisco product integration. I'm very pleased to report that it immediately started communicating once set up, and has been rock solid for 3 days streaming Hi Def 720p and 1080p video. The signal strength is fantastic and has out performed other routers I have owned in the past. Time will tell how it holds up over the long run. I will update this post if anything goes awry. Finally as icing on the cake, the router just looks cool. Thats always a happy bonus! The only negative I could find is that the tech support line isn't 24 hours. Seeing as how I didn't need it, I suppose that really isn't a negative in the truest sense. I'm a heavy Amazon user who doesn't even write reviews yet felt compelled to for this gem. A Great product, at a great price, and easy set up. Who could ask for more? Writing this after one month of having the product. I am quite happy with the product so far. I have three computers and four handheld devices all hooked up to it in a post WWII construction building (very solid concrete building). The device is set up in the first floor of the unit and I have no issues getting reception on any of the floors or areas of unit. Of course the reception is better in the first floor, but of course you will always have better reception the closer you are to the router. I will update this review if and when anything changes. This router was easy to install. I have Comcast and the modem speed is 52-53 Mbps. I only enjoy this speed when my computer is plugged into the modem. However, my old Netgear wireless router was only transmitting about 11 Mbps, which prompted me to get a new router. This one was cheap and advertised a speed of 150 Mbps so I assumed that it would have no problem transmitting a third of the advertised speed. We use Macs here and the one is about 15 feet from the router and in line of sight. My other Mac is on the floor above. Speedtest.net shows that both computers are receiving a signal that varies from about 22 to 31 Mbps. This is certainly faster than the old Netgear but no where close to the 52-53 Mbps speed put out by the modem. This router was easy to "not set up." (I mean, no set-up, just plug it in and plug in your laptop, and that's it). It self=initializes your laptop and didnt have to enter any codes or passwords. It was ready to go wireless right away. I expected much more preliminary set-up time, but nothing to it. Good reach. My home is 1870 sf, and 4 bedrooms. I have the router in the farthest corner of the home, and the bedrooms on the other side receive the signal fine. Reasonably priced, good product. I would recommend this product. This was purchased to replace an outdated router (8 years old). Installation was extremely easy, basically plug and play. In our office setting we use Macs as well as PCs (and a few pads, phones as well) and no one has had a moments problem jumping on to the network. Adequate signal strength, too!